I am grateful for the gift of art and have had the blessing of earning degrees in art. 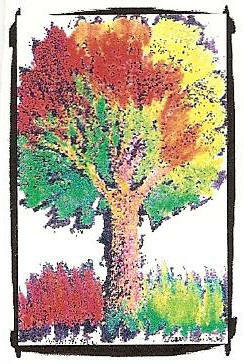 The logo on my artist/business card is the "Woman Tree". This was inspired by the women and men in my life who have nurtured me in many ways. That includes persons deeply rooted in faith as well as those who have helped me to branch out in new directions. I am a member of the Daughters of Charity, a religious community of women, which was founded by St. Vincent de Paul and St. Louise de Marillac over 300 years ago to serve persons who are poor. Sister Maria visits the Estrada. Hamburg, AR in 1989. For the past 11 years, I have served as outreach coordinator at Helping Hand of Greater Little Rock, Arkansas. I have recently been privileged to retire to art ministry where the sale of my note cards, prints, and paintings continue my mission. All proceeds benefit the Helping Hand of Greater Little Rock. Sister Maria and her mother Mary Liebeck, 1970.
spirituality. They are symbols of faith and hope for the future despite seemingly insurmountable odds. Another influence within the Sacred Feminine theme is Mary, the Mother of Jesus, who is an archetype of women everywhere. I was reminded of the Pieta when a mother cradled the body of her son who had been a victim in a drive-by shooting. In my portrayal of her sorrow, I included not only herself and her son but other family members who were also affected by the tragic loss. The "Cotton Field Madonna" shows a young girl holding a baby wrapped in a patchwork quilt surrounded by huge cotton bolls. Another Madonna painting has a whimsical title: "God's Favorite Colors Are Orange and Purple". Sister Maria graduates--Master of Arts from Univ. of Dallas, 1968. 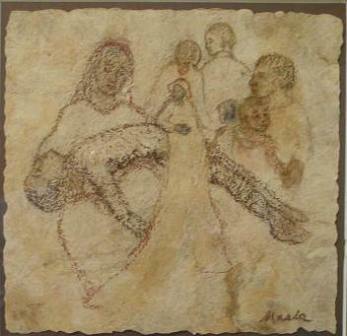 One of the amate works has a scriptural title: "Her Children Shall Rise and Call Her Blessed". The background is a woman who defines figures of all ages in the foreground. I discovered the figures by following the patterns in the texture of the paper itself. There is a watercolor and pastel painting entitled "Daughter of the Moon" which depicts an older Native American woman in a nighttime desert landscape I have chosen to honor the wisdom and beauty of the sage. In contrast to the figurative pieces I have also included floral subjects as well as landscapes. Some of the paintings in the show are prints as well as originals and the prices reflect this difference. There are also paintings in the form of note cards and prints that are matted. Prices range from $10.00 to $500.00 with greeting cards priced at $5.00 for a pack of 5. Please see the ORDER page for a printable order form.